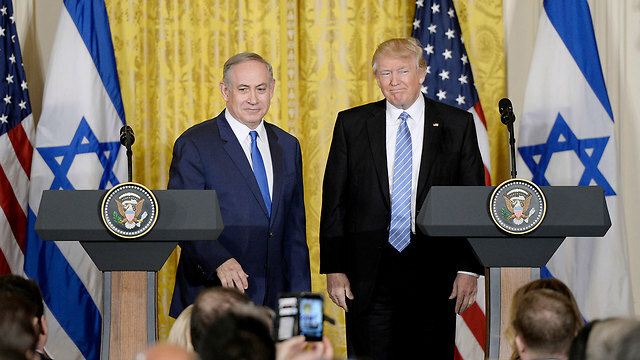 It’s hard to overestimate the importance of what was said Wednesday at the start of Prime Minister Benjamin Netanyahu’s meeting with US President Donald Trump at the White House. After all the understandable reservations, we can carefully assume that we are at the start of a completely different period from a diplomatic point of view. The United States in the Trump era, which is still the key power in the world, is clearly standing by the State of Israel. Trump’s statements were very clear, very sharp and completely adopted Israel’s stance, which rules out any unilateral Palestinian move. In fact, in some aspects Trump turned the wheel back 20 years, making it clear to the Palestinians that any accomplishment they wish to make will only arrive through direct negotiations with Israel, negotiations in which all options are open and on the table. From this aspect, Trump’s statement that the two-state solution is just one option is the most important statement. Trump put the diplomatic wagon, which deviated from its path many years ago, back on track. He reminded all of us of the final goal. It’s neither a Palestinian state nor an end to the occupation or the evacuation of settlements. The goal is peace. Granted, there was a certain, small, amount of disappointment in Trump’s call for a temporary halt of the settlement construction. But if we just recall the texts Netanyahu heard in Washington in the past eight years and make the comparison, we’ll realize right away that the Trump era is completely different from this aspect as well. Trump did not voice a single word of criticism about the extensive building permits in Judea and Samaria recently. Neither did he blast the Regulation Law or doubt Israel’s right to build in the settlements. Now, the ball is in Prime Minister Netanyahu’s court. The Trump administration is the most permissive administration Netanyahu could have dreamed of, an administration which is giving him the biggest maneuvering area possible. Nonetheless, it presents the prime minister with a much more complicated challenge. If until today Netanyahu focused, rightly, on preventing any damage to Israel and defending the settlement enterprise, he will now have to move to positive action. To outline a path and walk on it. The window of opportunity is limited. It’s very hard to estimate when it will be closed. Netanyahu must set brave objectives, like applying Israeli sovereignty in Judea and Samaria, and meet them. Any other outcome will be considered a failure.